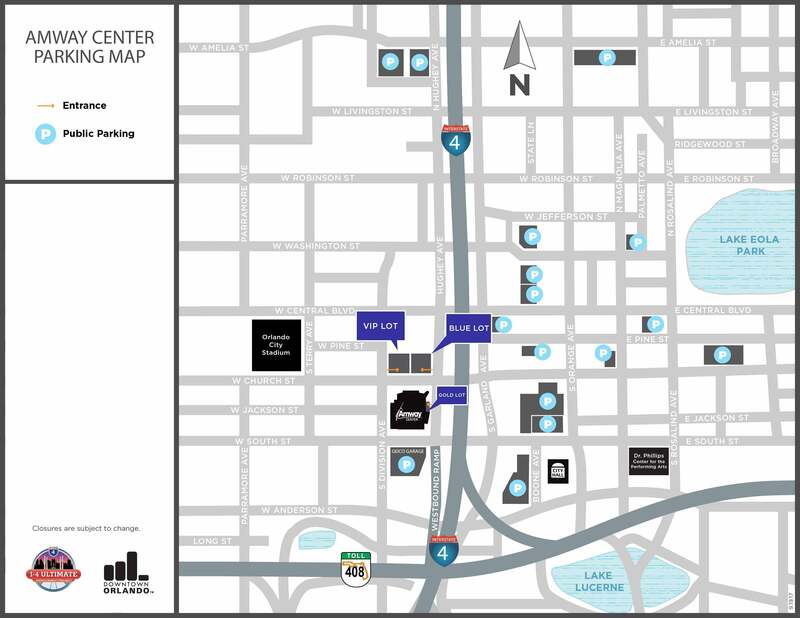 The Amway Center is pleased to offer our guests reserved/pre-paid parking in the GEICO Garage located at 400 West South Street. Reserved/Pre-Paid parking can be purchased through Ticketmaster.com and/or the Amway Center Box Office during regular box office hours. Purchases must be made by 5pm on the day prior to the event. 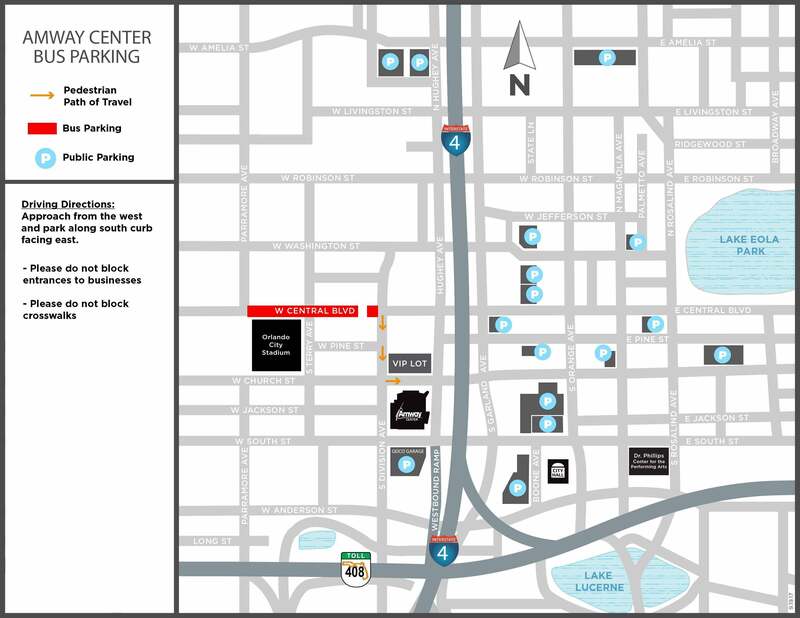 The City of Orlando has additional Downtown Orlando parking options that are available on a first-come, first-served basis. Parking rates vary from $10-$20. Please see the above map for parking lot locations around the City. Reserve your spot in the GEICO Garage here. If you purchased VIP Parking you will be parking in the lot on the north side of the arena. The entrance is located off of Division Ave between Church St and Central Ave. Bus parking is complimentary and available along West Central Boulevard. Buses will remain parked on the street for patron loading/unloading and is a short walk to the arena. Please refer to the below Bus Parking map for detailed patron path-of-travel. The first floor of the GEICO Garage is limited to a maximum clearance of 8’ 2”. Clearance on second floor and higher is 7’ 2”. First floor parking is limited on event days, patrons should consider a surface lot as an alternative. Additional parking is available in the downtown parking garages, with a fee to park. Click here to learn more. There are currently 4 electric vehicle charging stations, available on a first-come-first-served basis, for patrons parking in the Geico Garage. When parking for an event, access the garage from South St. The charging stations are on the right side of the first floor, just past the booth. In addition, please inform the parking attendant that you will be parking at the charging station. Fields Luxury Valet is located on South Street the drop-off is on Division just near South Street. Fields Luxury Valet can only be accessed by traveling west on South Street from Hughey. Fields Luxury Valet will open 60 minutes prior to a game and close 90 minutes after a game. Fields Luxury Valet is for Magic games only and is only available for certain courtside seat holders. The east-west expansion of the LYMMO system will largely operate in mixed traffic with the exception of several sections (Eastbound Central Avenue between Westmoreland and Division Avenue, Church Street Westbound (Lake to Magnolia Avenue), Southbound Magnolia Avenue between Church and South Streets (an existing LYMMO lane) and Westmoreland from Church to Central Avenue). The new route is proposed to include Lymmo Stops and new Lymmo Shelter stations. LYMMO map. LYMMO Map. Due to popular demand, SunRail #NightTrain service is now available during weekdays. For more on Sunrail and train schedule, visit SunRail.com. There are 170 bicycle storage racks in the GEICO Garage which is adjacent to the Amway Center (25 West South Street). Storage is on a first-come, first-served basis. There are also bicycle racks located under I-4 between Church Street and Pine Street. The Florida Department of Transportation encourages travelers heading to the Amway Center to use the 511 Traveler Information System to stay up-to-date on delays, road closures, construction and more. The 511 system provides information on all of Florida’s interstates, toll roads and other major metropolitan roadways. Drivers can get traffic updates by calling 511, visiting FL511.com or using the free Florida 511 mobile app available for iTunes and Google Play. Regional and roadway updates also are available on Twitter by following @FL511_Southeast. When travelling Downtown, please allow extra time due to construction on I-4 and consider using alternative modes of transportation including SunRail, Carshare, Bike Share, LYNX, LYMMO, carpooling and adjusting schedules when possible to avoid traffic delays. I-4 Ultimate is an important project for Central Florida. The 21-mile makeover — from west of Kirkman Road in Orange County to east of State Road 434 in Seminole County — will transform the region while connecting our communities, improving our economy and enhancing livability for everyone. Click here for additional I-4 updates.